It’s Ryan Dean’s final year at Pine Mountain and it should be a celebration. Instead, it is causing nothing but pain. His rugby coach assigned him the role as captain, replacing his dead best friend, Joey. If that didn’t make matters worse, Ryan Dean is rooming with a 12-year old claustrophobic freshman named Sam Abernathy. Ryan Dean’s drawings haven’t been giving him relief like they used to. He’s paranoid that N.A.T.E (Next Accidental Terrible Experience) is looming near. Does a visit from Joey’s brother, Nico, change anything? Will Ryan Dean ever enjoy his final year of high school? 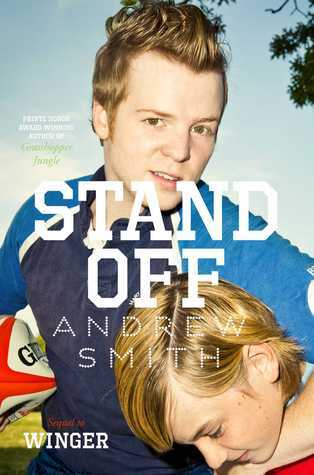 I received Stand off an advance copy from Simon & Shuster Canada and it did not disappoint. Sequels are hit or miss and Winger just blew my mind. This one was a hit. Ryan Dean’s struggles over the death Joey are realistic. Andrew Smith has a knack for merging humour and sympathy in such a natural way that Ryan Dean’s life seems, well, natural. The comics weren’t as enjoyable as the last, but suited Ryan Dean’s struggles. A brilliant sequel.